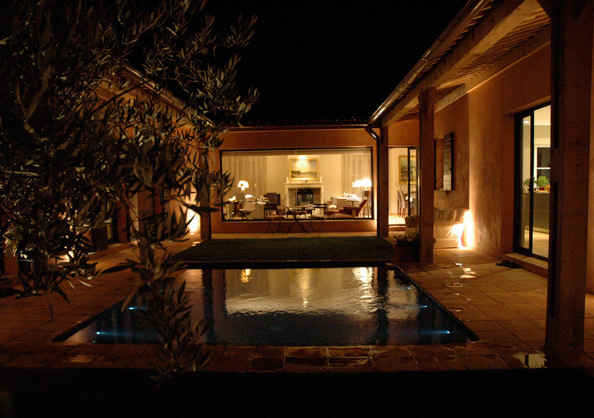 In the ancient Provençal language, Longo Mai means "a long and contented life" and the peace and tranquillity of this luxurious Villa in the Var provides the perfect setting for relaxation and rejuvenation. Owned by an interior designer, the Villa is also stunning both inside and out, furnished, finished and equipped to the highest standards. "Situated at the top of a hill, we found at "Longo Mai" a very rare commodity these days, a total sense of peace. The Villa recalled memories of a South American hacienda or a Moroccan riad. Light is an important factor - flooding all corners of the Villa and its terraces and garden in the day, and creating a fairy-tale atmosphere in and around the courtyard at night. The ultra-modern kitchen is a joy for both cooks and lovers of good food, whilst the terraces surrounding the Villa provide perfect places to relax throughout the day and in the evenings. Longo Mai is a small corner of Paradise." When Longo Mai was discovered by the current owner it was a virtual ruin, roofless and overgrown. Fortunately, as an interior designer, she could visualise its full potential and has transformed it into a very special property, strongly influenced by the architecture of a Roman villa or a Moroccan town house. The interior is extremely sophisticated, contemporary and very comfortable. Kitchen – ultra-modern, sleek and very well equipped with gas hobs, an electric oven and steam oven, electric Japanese grill, hot plate drawer, huge fridge, separate freezer, hot-plate drawer, dishwasher, waste disposal unit, two sinks, a "Quooker" (providing boiling water at the turn of a tap) and a CD Player. French doors open onto a covered, sheltered dining terrace with a table for 10 and a gas-fired portable barbecue. Separate glass doors open onto the enclosed garden with separate pool. Utility room - with a washing machine, dryer, iron and ironing board. Sitting room/dining area – virtually stretching the width of the villa and very stylish with comfortable sofas and armchairs, wood-burning fireplace, wide-screen satellite TV, DVD Player and Wi-Fi/Broadband internet access. A dining table at one end seats 10, a panoramic window overlooks the courtyard pool and French doors open onto the terraces on the east and north sides. Bedroom 1 – the master bedroom with a 6 ft bed (180 cms), windows on one side and satellite TV. An en-suite (Bathroom 1) has a bath, walk-in shower, 2 wash basins, bidet, W.C., a window on one side and sliding doors to the courtyard. Bedroom 2 – with a connecting door into Bathroom 1 (which can be locked) and access through a sliding door from the courtyard. With a 5 ft bed (150 cms) and a window on one side. An en-suite (Bathroom 2) has a bath, walk-in shower, W.C and windows on one side. Bedroom 3 – accessed through sliding doors from the courtyard, with a 6 ft bed (180 cms), TV and windows on one side. An en-suite (Shower Room 2) has a walk-in shower, a W.C. and windows on one side. Bedroom 4 - with the option of either a 5 ft (150 cms) sofa bed or two 3 ft (90 cms) single beds, plus satellite T.V., a DVD player and French doors onto the terrace. An en-suite (Shower Room 1) has a shower, wash basin, and a W.C.
Longo Mai is set in one hectare (2½ acres) of grounds on an east-facing hill and overlooking a wooded landscape. On the south side of the Villa, a dining terrace is shaded by mulberry trees and has a table seating 6. A spectacular, gated arch opens into a courtyard, at the centre of which is an illuminated pool which measures 4.1 metres in length (13' 6"), 3.8 metres in width (12' 6") and 1.35 metres in depth (4' 5"), with wide Roman steps at one end. The pool is filtered, heated and alarmed. A canopied walkway runs round three sides of the courtyard with a dining table seating 6 on one side, whilst an olive tree stands sentinel just inside the arch. .
Longo Mai has a terraced garden, with an automatic watering system. Lawns surround a swimming pool, 15 metres in length (49 ft), 4.5 metres in width (15 ft) and 1.3 metres in depth (4 ft). There are wide Roman steps at one end. On the decking around the pool are 8 sun beds and 2 sun umbrellas. The pool is filtered and with a slightly saline content (the strength of human tears) to avoid the use of chlorine and helping to keep the water crystal clear. It’s also floodlit and alarmed. (As neither pool exceeds 4ft in depth, diving is not allowed). At the far side of the pool is the Pool House which can be lit at night, and with comfortable seating. Elsewhere in the garden is a ‘boules’ pitch. The ‘boules’ are kept in the Villa. Whilst it’s an oasis of peace and tranquillity, Longo Mai is only 5 to 10 minutes' drive from the pretty, medieval town of Lorgues with its exceptional weekly market, good shopping and lively bars and cafés. Lorgues also boasts a number of restaurants in various price ranges, including the Michelin-starred, truffle-focused, Bruno's. Longo Mai is 75 minutes from stunning Aix-en-Provence which, quite apart from its numerous museums and art galleries, hosts some of the most important musical events in France. The Villa is 50 minutes from Toulon (Hyères) airport which has some international flights, whilst Nice and Marseilles international airports (the latter called 'Marignane') are one hour's drive. The super-fast train, the TGV, stops at Aix TGV station (between Aix-en-Provence and Marseilles), although some trains continue, rather more slowly, to Draguignan/Les Arcs (about 30 minutes from the Villa). Eurostar trains stop at Avignon (90 minutes' drive) and the nearest entry to the autoroute is 30 minutes' drive. Tenants will be met on arrival, shown how everything works and given the codes for the alarm system. Jocelyne is the cleaner, employed by the owner for 3 hours per day on 2 days per week during which time she will concentrate on general house cleaning. She is prepared to work extra hours and/or days should tenants so wish, her charge being €15 per hour for any extra hours. Provided sufficient notice is given, a part-time cook and/or a babysitter can probably be provided. His/her/their charge will be the tenants' responsibility, and can be ascertained in advance should tenants so wish. Garden and pool maintenance are the responsibility of the owner and will be carried out by an outside contractor. The house manual describes how everything works (both inside and out). It lists a doctor, a dentist, a plumber, an electrician, the pool maintenance man/service, plus other emergency and useful numbers. There are telephones throughout the Villa, and WiFi/Broadband internet access. This is very much an "all-year-round" Villa and is both heated and cooled by an underfloor system. A wood fire can be lit in the sitting room fireplace and logs will be replenished as required. There are English-language books and DVDs throughout the Villa, as well as board games and playing cards. There are CD players and portable radios throughout the Villa. Markets abound in the surrounding towns and villages, the largest and arguably the best of which is in Lorgues. Details of where and when they take place are in the house manual. The local specialities of pottery and Provençal fabrics are widely available. Fairs and festivals (including concerts at the nearby Abbaye du Thoronet) take place throughout the summer, with details in the house manual. A visit to the Tourist Office in Lorgues is also thoroughly recommended. The Tennis Club in Lorgues has 4 outdoor and 2 indoor courts. Booking information is in the house manual. There are a number of good-to-outstanding 18-hole golf courses within 30 kms. Arguably the best are St Endréol and Barbaroux, details of which are also in the house manual. There is swimming, sailing and windsurfing on the Lac de St Croix, whilst the spectacular Gorges du Verdon offer gentle to more exhilarating rafting, canyoning, kayaking and canoeing (both 50 kms from the Villa). Electric motor boats can be hired to visit some of the gorges. There are also details in the manual of nearby riding stables, providing everything from lessons to dressage to trekking in the surrounding countryside. There are marvellous walks in several directions with details in the house manual. There are many stunning towns and villages in the vicinity, including the following, to name but a few: Entrecasteaux, which boasts a beautiful Château and gardens designed by Le Nôtre in the 17th century (he also laid out those at Versailles); Tourtour, which is known as "the village in the sky", whilst Aups is the gateway to the Haut Var and said to be the truffle capital of France; Salernes, which is renowned for numerous pottery shops and its excellent (but small) Sunday market. There is a wide selection of restaurants in the area, ranging both in price and sophistication with details and descriptions on many of them in the house manual. Truffles are the local speciality. The beaches of Ste Maxime are 40 minutes' drive and those of St Tropez, Cavalaire and Cannes are about an hour out of high season, although the journey can take rather longer in July and August. Vineyards surround Longo Mai, providing red, white and rosé wines (rosé wines being a Provençal speciality). Most offer tastings and on-the-spot purchases, whilst the excellent Maison des Vins in Les Arcs sells a comprehensive selection of the region's finest wines. A nearby lavender farm makes and sells essences and related products. There are also nougat and honey producers in the vicinity. The neighbouring Château de Berne is noted for its wines, as well as for its restaurants, adventure playground, art exhibitions and jazz concerts. There are a number of other children's adventure playgrounds and zoos in the area, including one near Vidauban which provides a range of activities for all ages from 3 to the late teens. Details of these (as well as of quad-biking opportunities for older children) are in the house manual. Availability and rents for all other months are negotiable. Unless otherwise agreed, all rentals will begin and end on a Saturday, and will be for a minimum of one week. Tenants are required to arrive as soon as possible after 5pm on the commencement day, and to leave no later than 10am on the agreed day of departure. They will be met on arrival by the owner or her representative. 25% of the rent will be payable to Anglo French Properties Ltd on signing the Rental Agreement, with the 75% balance to be paid 8 weeks prior to the commencement of the tenancy. The Booking and Security Deposit of £500 will also be payable to Anglo French Properties Ltd on signing this Rental Agreement. This will secure the booking, and will cover the cost of (a) telephone calls made during the tenancy on the house telephone, (b) replacing/making good any losses, breakages and/or damages incurred during the rental, and (c) any exceptional cleaning work which may be required at the end of the tenancy. This Deposit will be refunded (less any deductions as outlined above) within 4 weeks of the tenancy's conclusion. Unless otherwise agreed, there should not be more than 8 people, including children and babies, staying at Longo Mai at any one time. The owner's insurance policy requires that all exterior doors are locked, that all windows and sliding/French doors are closed, and that the alarm is set whenever tenants are away from the property.